MechCaL has invested in cutting edge technology to enhance the productivity, efficiency and production performance of their manufacturing facility. They have procured a Yaskawa Motoman Robot to carry out several vital tasks that will enhance the already cutting edge design of MechCaL’s advanced mining ventilation fans. Production environment requirements in the field of mining ventilation are very high. Not least, strict cleanroom criteria, testing facilities and staff safety present several industry specific challenges, among others. In addition to these challenges, in order to survive in the highly competitive mining market, companies also need to make sure that they increase their production effectiveness and minimise costs. As part of their ethos to remain the leaders in innovative and technologically advanced ventilation products, MechCaL’s procurement of the Robot will ensure that they stay at the forefront of meeting production requirements while translating growth in their manufacturing capacity to cost savings, reduced lead times and superior product delivery for their clients. The Robot has been installed within a newly constructed ‘robot cell’ at MechCaL’s manufacturing facility in Pretoria. 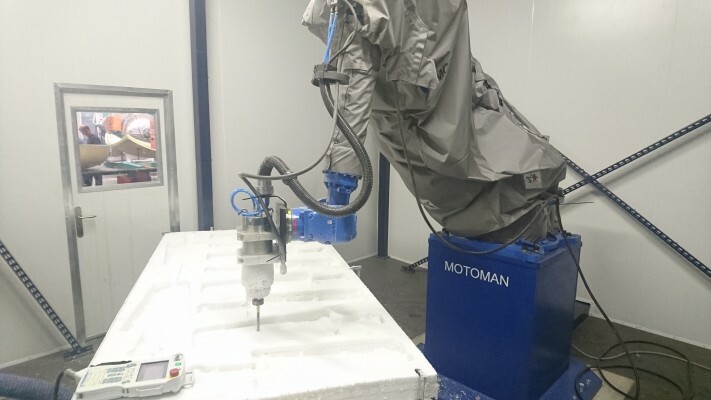 The qualified engineers on MechCaL’s design and manufacturing team will be using the Robot for cutting the plugs that are required for producing moulds and also for cutting moulds directly. The Robot’s multi-station capability will be used to trim and drill composite fan parts with greater accuracy and faster output compared to the previous manual process that was carried out using jigs. Manufacturing large three-dimensional blade shapes and structures requires large moulds. Previously, MechCaL outsourced the manufacture of the necessary mould plugs to suppliers that used CNC routers or milling machines. Having this capability in-house, says Michael Minges, Principal Engineer and Director of Operations at MechCaL, means that their overall production costs can be lowered. “Outsourcing the mould plug manufacturing was done at considerable cost and involved lengthy lead times. 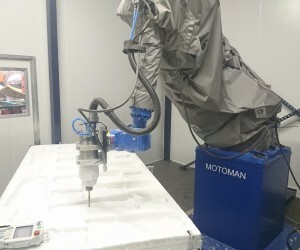 With the addition of the Yaskawa Motoman Robot, all of this can now be done in-house with a much faster turnaround time and a reduction in cost,” he says. According to Minges, increased efficiency will come from the Robot’s capacity for multiple workstations that will allow for the finishing of composite parts without supervision which, once set up, can be run overnight. “Multiple workstations will allow us to trim and drill many composite parts in a single go. By removing outsourcing from the production process, MechCaL will have full control of its tool making and have a quicker turnaround time from design to production and thereby improve delivery of products,” says Minges adding that this gives MechCaL added production capacity which in turn results in enhanced output. In order to accommodate the Robot within their factory to the required industry standards, MechCaL constructed a dedicated Robot Cell. The cell will contain any excess material that the Robot creates during its operations, such as e-glass, carbon dust, wood flakes etc., to protect the factory environment. Containment of these particles means that they can also be extracted and disposed of more efficiently. According to Minges, the moving Robot arm also exerts considerable force when in operation and could injure someone. The cell therefore has automatic shutdowns linked to the opening of access doors to maintain the safest possible working environment. The main advantage of the addition of the Robot for MechCaL’s clients would be reduced costs. This is mostly due to a reduction in scrap percentage – as a result of the Robot’s accuracy – and removal of the dual margins of outsourcing and in-house finishing. Clients will also benefit from faster turnaround times from concept to product delivery along with improved quality on tooling and the final product. The Robot will also provide MechCaL’s engineers more scope on innovative designs which will translate to more efficient fan performance.